Our meetings are the 2nd Tuesday of every month. 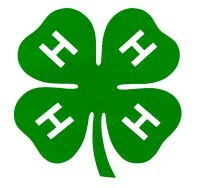 The 4-H emblem is a four leaf clover with the letter "H" on each leaf. The four H's stand for Head, Heart, Hands, and Heath. The leaves of the clover are green and the H's are white. The white is four purity and the green is natures most common color and symbolizes youth, life, and growth. Below you will find places to get Record Book Forms. Print them up at the beging of the 4H year and use them to keep your records. Rewrite them nicely at the end of the year and earn awards for your Record Books.